Time & Space is a self-management workshop for anyone who cares for someone living with and beyond cancer. It is a three-hour workshop based on the full six-week HOPE FOR CARERS programme and has been created for carers who are unable to commit the time to attend the longer course. 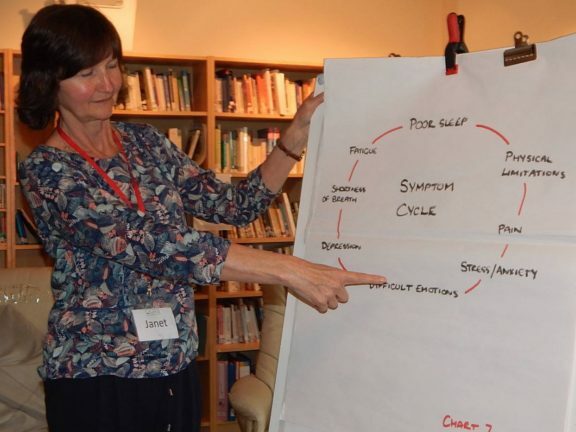 The purpose of the workshop is to create a safe environment in which those who care for someone living with and beyond cancer have time both to reflect and to develop self-management techniques which will enable them to meet more effectively the emotional, physical and lifestyle changes and challenges they face. This workshop will enable you to access and experience the support of others. The Time & Space workshop is delivered by experienced and accredited HOPE facilitators and may be available either as a three hour workshop or as two shorter sessions on separate days. For more information or an informal chat, please contact Janet Hickman at the Cambridge Cancer Help Centre or on 07866 331782. Alternatively, you can email janet.hickman14@icloud.com.